— Wait though, that assumes you start from Edinburgh or Glasgow. For this example of tours from Edinburgh, take the fast A9 motorway north-west for Stirling – well under an hour. You can’t go wrong finding Stirling Castle. Like Edinburgh Castle it sits prominently on a crag and dominates the skyline. Just to take in the ambience you could find a parking place in the lower end of the town and keep walking uphill until you find yourself in the esplanade, the parade ground outside the castle. If you’re less energetic you can park up here as well – it’s only fair to tell you now. 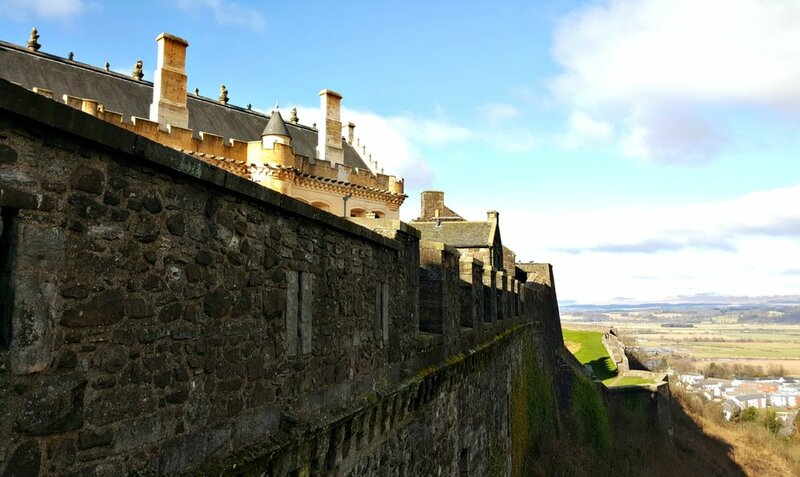 Stirling with its castle was once one of the most important strategic places in Scotland. Whoever occupied Stirling Castle, formerly at the lowest bridging point of the winding River Forth, controlled the main route between Highlands and Lowlands. The most famous battle in Scotland’s story, the Battle of Bannockburn in 1314, which won almost four centuries of independence from England, was fought close by, with the castle as a prize. Stirling Castle and the outer defences. Yes, really, you should stroll around a bit if time permits. (Now, ahem, best tourist guide voice.....) The complex of buildings which today makes up the Castle, date from various times and show the many modifications made to them as the castle developed, for example, from the royal court of the Stewarts, kings of Scotland, into a military headquarters. The outer defences of a great curtain wall and batteries were rebuilt around 1708. Note the conspicuous Palace built by King James V between 1538 and 1542. This shows the influence of French masons who carved the decorative figures that festoon the ornately worked outer walls. The Great Hall, now restored, was originally completed in the time of King James IV in 1503. Before the Union of Parliaments in 1707, this building had been used as one of the seats of the Scottish Parliament. Afterwards this hugely important building in Scotland’s story became first a riding school, then a barracks, until a recent programme of extensive restoration work restored its former grandeur. A costumed guide in the restored palace of James V.
The Stirling Heads Gallery is a must-see– these 16th-century oak medallions are carved with images of kings, queens, nobles, Roman emperors and characters from the Bible and Classical mythology. There are other buildings to see and you should certainly allow at least an hour or so if you’re doing the tour. If you just want to admire the building from the Esplanade, then look out for the marks of bullets and cannon balls on the walls, many from Bonnie Prince Charlie’s attempt to capture it. It’s such a wide panorama from Stirling Castle that you can only get chunks of it in your viewfinder. The Trossachs hills that you may have seen distantly from Edinburgh Castle are very conspicuous. Go from Stirling to Callander. If you’re a Monty Python fan, then you can go via Doune Castle, where scenes from Monty Python and the Holy Grail were filmed. 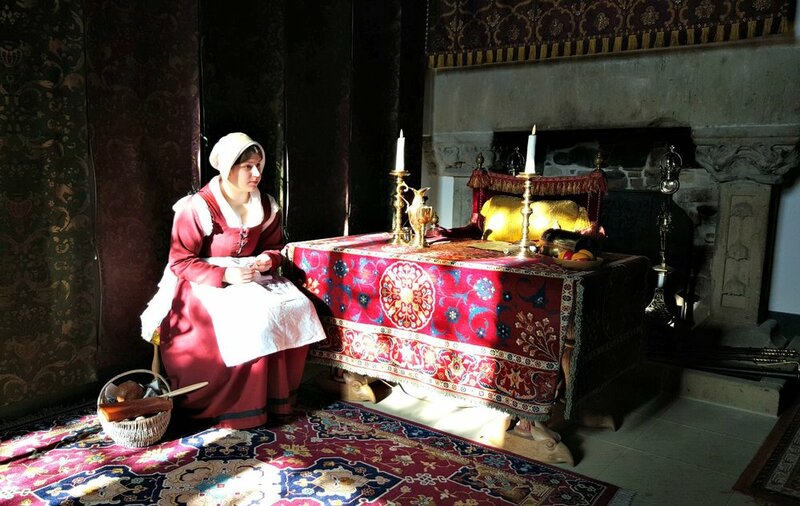 These visitors are taking part in a tradition of Scotland tours that goes back more than two centuries – because it was towards the end of the 18th century that the ’Cult of the Picturesque’ came about. As early as 1794, the local minister in Callander wrote that 'The Trossachs are often visited by persons of taste, who are desirous of seeing nature in her rudest and unpolished state.' Remember this was in the days when touring the Highlands of Scotland was a really big adventure! The Trossachs in winter - a reminder that this is an all-season tour - unless the weather is very bad. The famous Scottish writer Sir Walter Scott travelled here on legal business as early as 1790. Gradually, the wooded hills and lochs worked their magic on him, so that by 1809, already as an established literary figure, he was quartering the ground. He even checked riding times and distances for complete accuracy within the verse-world he was soon to create. His work was called ‘The Lady of the Lake' and after its 1810 publication it became a best seller. This work was a major milestone in the development of Scotland tourism. Take the road at Kilmahog westwards to judge for yourself. You’ll probably end up in the carpark at the side of Loch Katrine with enough time for a cruise on the SS Sir Walter Scott, the steamship that has sailed the loch for more than a century. Why are the Trossachs popular? Either as you drive around, or as you stroll along the pedestrian-only little road that runs round the shore of Loch Katrine from the main carpark, you’ll work out the real secret of the Trossachs. It’s Scotland-Lite. Nothing too demanding. Pleasant but not spectacular. Easy to reach - and so one of the most popular day tours from Edinburgh. But it's still worth doing. After all, visitors have been covering the ground here for more than two centuries. So, to conclude, it’s southwards and up and over by the Duke’s Road (or the Duke’s Pass), called after the Duke of Montrose – a descendant of the aristo who was an enemy of Rob Roy – who had it built in 1932. Drop down to the little tourist resort of Aberfoyle and turn east for Edinburgh, more than an hour away. Follow the links below for more good stuff about how cruising Loch Lomond and the Trossachs made for a great day out, even in Victorian times. And, like the Trossachs, discover why Loch Lomond was another early tourism honeypot.